The launch of Sputnik 50 years ago almost triggered World War III, if not for a private agreement among two ex-generals. Now, with the help of recently released documents from the former Soviet Union, the full story of how close we came to global nuclear war can be told for the first time. DAVID HOFFMAN is one of America's veteran documentary filmmakers. During his 40-year career, he has made four feature-length documentaries including King, Murray; It's All Good; Sing Sing Thanksgiving with B.B. King; and Earl Scruggs: His Family & Friends. King, Murray, an experimental feature doc about an insurance salesman who goes to Las Vegas on a junket to gamble with other high rollers, was the winner of the Critics Award at the 1970 Cannes Film Festival. Hoffman has also made more than 100 primetime documentary television specials and series, mostly for PBS and Turner Broadcasting. He lives and works in Santa Cruz, California. Before starting his work on Sputnik Mania, ERIC REID received a bachelor of arts in film and digital media from the University of California at Santa Cruz in 2006. He has worked closely with David Hoffman for the past two years as an assistant editor and post-production supervisor. This is his first time producing a film. As the world watched in horror, Hurricane Katrina hit New Orleans on Aug. 29, 2005. Like many who watched the unfolding drama on television news, director Spike Lee was shocked not only by the scale of the disaster, but by the slow, inept and disorganized response of the emergency and recovery effort. Watching his fellow Americans suddenly turned into "refugees" in their own country, Lee was moved to document this modern American tragedy. Lee and his team selected close to 100 people from diverse backgrounds and representing a wide range of opinions to interview. SPIKE LEE is widely regarded as today's premier African-American filmmaker. Lee's films Girl 6, Get on the Bus, Do the Right Thing and Clockers display his ability to showcase a series of outspoken and provocative socio-political critiques that challenge cultural assumptions not only about race, but also class and gender identity. His debut film, She's Gotta Have It, earned him the Prix de Jeunesse Award at the Cannes Film Festival in 1986. Lee's timely 1989 film Do the Right Thing garnered an Academy Award nomination for Best Original Screenplay and Best Film and Director Awards from the Los Angeles Film Critics Association. SAM POLLARD's first assignment as a documentary producer came in 1989 for Henry Hampton's Eyes on the Prize II: America at the Racial Crosswords, which brought him an Emmy. He later served as co-executive producer and producer of Hampton's documentary series I'll Make Me a World: Stories of African-American Artists and Community, winning a Peabody Award. He also received a Peabody as a producer on the PBS series The Rise and Fall of Jim Crow. Between 1990 and 2000, Pollard edited a number of Spike Lee's films, including Mo' Better Blues, Jungle Fever, Girl 6, Clockers and Bamboozled. In addition, Pollard and Lee co-produced the feature-length HBO documentary 4 Little Girls, which was nominated for an Academy Award, and HBO's Jim Brown All-American. In the same spirit of the award-winning public radio show, the televised version of This American Life takes 30-minute looks at stories from all over the country. Host and executive producer Ira Glass and a small team of radio producers and filmmakers spent six months on the road--traveling to Iowa pig farms, following a first-time filmmaker in California, photographing a raucous night at an Illinois hot dog stand. The result is true stories that are surprising, emotional and often funny. 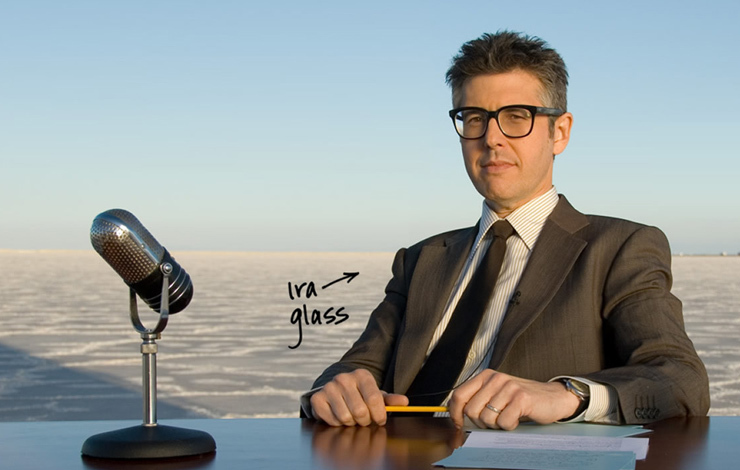 IRA GLASS began his career in 1978, as a 19-year-old intern at National Public Radio's network headquarters in Washington, DC. Over the years he worked on nearly every NPR network news program and held virtually every production job. He is the host and producer of This American Life, which had its premiere on Chicago's public radio station WBEZ in late 1995 and is now heard on more than 500 public radio stations each week by over 1.7 million listeners, distributed by Public Radio International. Under Glass' editorial direction, This American Life has won the highest honors for broadcasting and journalistic excellence, including the Peabody and duPont-Columbia Awards, as well as the Edward R. Murrow and the Overseas Press Club Awards. It is known as the court of last resort, where nine judges appointed for life make monumental decisions that govern our everyday lives. With immense power and considerable mystery, the court of final appeal has helped author the history of America. The series profiles the inner workings of the Supreme Court- the ultimate interpreter of the United States Constitution. THOMAS LENNON's work as a documentary filmmaker has earned him two Emmys, two Peabodys, the duPont-Columbia award and two Academy Award nominations, culminating in 2006 with his first Oscar, for the documentary short The Blood of Yingzhou District. He has explored a range of racial and ethnic themes in Seven Days in Bensonhurst, Long Journey Home, Unchained Memories, Jefferson's Blood and most recently, Becoming American: The Chinese Experience. He is currently collaborating with Ruby Yang on a series of public health programs for Chinese television. JODY SHEFF is the executive producer of history and features programming at Thirteen/WNET New York. She also produced the PBS special A Conversation with Bill Moyers and Ursula K. LeGuin, and was series producer for the Emmy Award-winning science series Innovation, as well as for the syndicated series The World of Nature with Walter Cronkite. Sheff produced, directed, wrote and edited for many national PBS series such as Nature, Great Railway Journeys II, Legendary Trails, Sesame Street and American Masters. Barreling along freeways from behind the wheels of their big rigs, three women truck drivers share their humor, insight and experience of driving 18-wheelers for a living. Long Haul enriches and challenges every preconceived notion of truck driving, while seeking to understand what is gained and what is lost as a woman, a mother and a trucker on the open road. master's thesis film in documentary film and video from Stanford University. Her short films have screened in festivals worldwide, including Full Frame, Telluride, Slamdance and Mill Valley, and have received numerous awards, including a Student Academy Award. Hudson is based in New Mexico and has started a documentary production organization, Rotation Films. She is at work on her first feature, In Place, Out of Time, about a rural elderly man's quixotic quest to preserve the past. In addition, she works as a freelance producer and cinematographer and as a part-time university instructor in documentary film production.